Here is an article written by my good friend, Rodney Sessions, about life in Petal. I was born in the village of Rose Hill quite a few decades ago. My father was career military. My time spent living in this rural village with my grandparents depended on his deployment. Some of my father’s assignments allowed for families, and some didn’t. I have lived all over the world, but I spent a significant portion of my formative years on my grandparents’ hilltop farm. Rose Hill will always be my hometown. We moved into our current residence in Petal n 1989. Prior to that time, I had never lived in any house more than 3 years at a time. Twenty-nine years of living, working and forming wonderful relationships and friendships have made Petal my second hometown. Petal is a small but growing town. Our schools are nationally recognized. We have an abundance of churches and houses of worship. A great Civic Center, municipal offices, Library, Veteran’s Memorial, and city park are focal points of downtown Petal. Petal is blessed with several medical and dental clinics. I have had the same Petal family doctor for the past twenty-something years. I would not trade him for any big city doctor. He gives you sincere care and time. He and his team still practice the art of medicine as well as the science of medicine. You will find numerous national chains and businesses in my hometown, but you just cannot beat the local businesses for down-home service. Petal has been called the “Friendly City”. I think the moniker is based on the caring, helpful, and supportive people you will meet everywhere you go in our town. Petal was named by one national publication as the safest city in Mississippi. We have a wealth of great neighborhoods. Our recreational and youth sports facilities and play grounds are second to none for a city our size. My hometown is a wonderful place to raise children. One of my favorite places in town is the Family Y, which is a wonderful place for people of all ages. We are also blessed with numerous other fitness centers and walking tracks. There are plenty of places to get in shape in Petal. If you enjoy good food as much as I do, you will most certainly enjoy a wide and growing variety of over 20 great eating places in the “Friendly City”. I do enjoy coffee and coming up with solutions to all the world’s problems with my old Codger buddies each morning at our favorite breakfast hangout. I think every small town has a similar place for its old Codgers to gather. The relatively new Petal River park has miles of woodland trails, mountain biking trails, and a nice new walking track. The city is planning a big Independence Day Celebration at this nice park along Leaf River. Even though I have lived and traveled in big cities all over America and the world, I am a small town kinda guy at heart. If you prefer a larger city or need additional services, we have a nice one right across the river. Petal suits me just fine. I am sure the people in Purvis, Richton, Sumrall, and other small towns in the Pine Belt Area feel the same way about their own hometowns. I would love to see some community columns about the uniqueness of each of these fine towns. I believe the strength and vitality of our nation is built on small towns and hometowns all over America. Get ready for the biggest event of the year! It’s been too long since we have had a 4th of July fireworks celebration in Petal. We WILL have one this year and it will be bigger and better than ever because we will be joining our friends across the river. 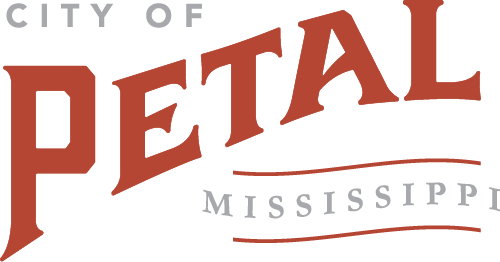 For the first time in recent memory, the City of Petal, the City of Hattiesburg and the Forrest County Board of Supervisors are sponsoring an event together along with presenting sponsor Coca Cola. The Star Spangled Celebration on the River is organized by the Petal Area Chamber of Commerce and the Historic Hattiesburg Downtown Association with a goal to bring visitors from across the area to our cities and to offer a first class, family friendly event for all to enjoy. It is a truly unique event offering two locations across the river from each other. Let’s call it dueling fireworks! In Hattiesburg the event is located at Chain Park and in Petal it will be at the Petal River Park. Each side of the river will have live music, food vendors, beverages and each side will have a simultaneous fireworks display over the river at 9:00 pm. One difference is that the Petal side of the river will remain alcohol free while the Hattiesburg side will have beer sales on site. From the chamber’s point of view, this is about more than fireworks. It’s about two cities and the county cooperating together. It’s about promoting a great natural resource, the Leaf River. It’s about introducing visitors to Chain Park and the Petal River Park. Both are wonderful parks that are virtually unknown and under utilized. It’s about the Petal Area Chamber of Commerce and the Historic Hattiesburg Downtown Association joining forces to organize an event that is all inclusive and which benefits both cities and organizations. Finally, it’s about pride. Pride for our country, our state, our county, our cities and our quality of life here. Sponsorships are available for the celebration as well as opportunities for select vendors. Call the Petal Area Chamber of Commerce for more information. 601-583-3306.
https://petalchamber.com/wp-content/uploads/2018/05/Facebook_Star-Spangled_Event-Cover-Photo-2.jpg 600 1200 Petal Area Chamber of Commerce https://petalchamber.com/wp-content/uploads/2018/01/petal-area-chamber-of-commerce-300x175.png Petal Area Chamber of Commerce2018-05-04 12:43:362018-05-04 12:43:36Get ready for the biggest event of the year! Actually, it’s time for Petal to have a new city map. The chamber office and city hall are completely out of maps and have been for quite a while. The chamber board of directors have discussed this issue several times over the past 4 years. It was the consensus that people don’t use printed maps anymore. We believed that instead they rely on GPS technology to get them from point A to point B. However, that is not the case. The chamber office has had consistent requests for a city map for the past few years. The fact is that a map is not about how to get from one point to another. People look at maps to get an overview of the entire area. They want to get familiarized. So, we are moving ahead with the publication of a new map. But wait, this project will have some additional perks that keep up with newer technologies. There will be an interactive iMap for mobile devices. Anyone can use the iMap to find restaurants, shopping areas, local parks and recreation areas. Advertisers in the digital GoGuide® will be linked to their website, giving readers one-click access to your business. We are pleased to announce our new partnership with Lunar Cow Publishing, a firm specializing in marketing, for the 2018 Petal Area Chamber of Commerce Map. We are excited about the opportunities this new map will offer to our local businesses. The 2018 Petal Area Chamber of Commerce Map is a primary fulfillment piece for chamber inquiries and will be the first resource that many visitors, community and business members use when planning a visit or move to the Petal area. Click on the link below for more information and a rate chart. Get your business on the map! CLICK HERE TO DOWNLOAD A RATE CARD! 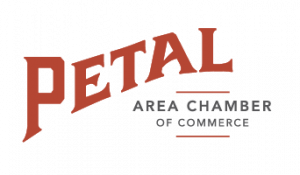 Join us for the Petal Area Chamber of Commerce Lunch & Learn on Wednesday, March 14. The lunch is held at the Petal Civic Center from 12:00-1:00. Members and non-members are invited to attend. Lunch is 10.00. This month we will have a particularly timely presentation by Dr. Linda Foley concerning Crisis Intervention. Lt. Craig Locke of the Petal Police Department will also be on hand for the presentation. At the Petal Area Chamber of Commerce, we believe strongly in a very bright future for the City of Petal! Our goal is serve our city and our members by providing strong leadership for those who would seek to grow, live or play in Petal, MS. In order to achieve this goal, we know that we must be continually looking ahead, solving big problems, and providing the very best resources for all we serve. Over the past months, we have partnered with Own Your Hill, a Mississippi Growth Marketing company, to help us develop strategies and marketing assets that will allow us to better serve our members, to reach more people who might be interested in investing in our community, and to help us show the world the immense value of Petal as a business location, a home, and a travel destination. Our new website is a puzzle piece in this new strategy for long-term growth. Here, you’ll find great statistics about The Friendly City, coupled with information and resources categorized to best serve our visitors seeking to grow here, live here and play here. A new identity for the PACC, and a clear path forward. Before work on the new website and other marketing materials began, we spent time going through a Roadmapping process – a strategy method designed to help us find the deeper story behind the PACC, as well as the City of Petal. What we found was that our citizens and chamber members believe deeply in the value of family, traditions, and educational and entreprenurial success. Guided by our story and values, Bethany and her team designed a new visual identity that calls to mind past eras where family dinner was a priority, Friday nights were sacred, and a letterman jacket signified more than athletic success – it was a visual reminder of the value of team spirit, hard work and the dream of a bright future. 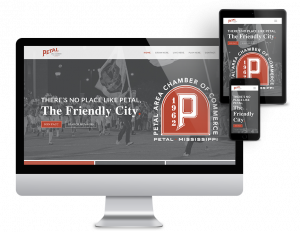 Our new brand signifies a new day for the Petal Area Chamber of Commerce. We invite you to join us as we work to grow our beautiful town, and we hope you’ll be a part of all that is to come. 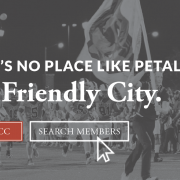 Sign up for email updates to be the first to know about great events right here in Petal, updates about The Friendly City and so much more!